Let’s face it, a lot of people become concerned if they look in the mirror and see too much of their forehead. 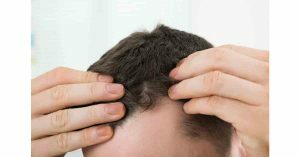 If you’re troubled about hair loss or thinning hair, that very often means you’re worried about the state of your hairline. If you have a high hairline, it can mean many things. It can be something you inherit, or it could mean that you’re losing your hair. RHRLI wants you to understand the facts about high hairlines. We also want you to know what you can do about correcting high hairlines, particularly when they’re related to hair loss. At RHRLI, we offer a permanent solution to hair loss using modern hair loss treatments on Long Island. We employ a state-of-the-art robotic hair transplant technique using the ARTAS® System. This advanced technology offers a less painful and more precise alternative to traditional hair transplant surgery. Do you Have a High Hairline? You may ask yourself, what constitutes a high hairline? If you’re comfortable with how your hairline looks, then you shouldn’t worry. But if you have questions, here are some general guidelines. For women, who often seek treatment for high hairlines, it’s considered normal if your hairline forms an upside-down U, according to the website wiseGEEK. It’s normal for men to have their hair form a U-shape. A woman’s hairline is considered normal if it’s 2 to 2.4 inches or 5 to 6 cm above the eyebrow. For men, it’s normal to have 2.4 to 3.2 inches or 6 to 8 cm above the eyebrow. Widow’s peaks are not uncommon for women and sometimes are seen in men. Irregularities such as cowlicks occur in both men and women and are considered normal. If it’s clear that you have a high hairline, you usually have two options: hairline lowering surgery or a hair transplant procedure. Surgical hairline advancement involves removing a part of the skin next to the hairline. This will lower the hairline, according to the website MedHalt. There are several drawbacks to surgical procedures. One of them is scarring, which can take 6 to 12 months to diminish, according to MedHalt. There will be stitches and a 7 to 10 day recovery time after the operation. Sometimes recovery can take up to three weeks. Other side effects include numbness of the forehead, swelling of the treated area and bleeding near where the surgery is performed. A big consideration for anyone having cosmetic surgery is making sure the procedure is done properly by a qualified surgeon. A less invasive alternative would be hair transplant surgery. This would involve transferring hair from the donor area to the region of the head where the original hairline exists. If you are considering a hair transplant, RHRLI is the only hair loss treatment center on Long Island that has the ARTAS® System. Our procedure is called robotic follicular unit extraction (RFUE). It’s less painful than traditional surgical techniques used in hair transplantation with a much shorter recovery time. Patients usually resume normal activity in a day or two. RFUE is more accurate than other forms of follicular unit extraction (FUE) because it employs sophisticated robotic technology as opposed to manually operated systems. It will give you a healthier looking head of hair. If you’re concerned about a high or receding hairline or any type of hair loss, contact the experts at RHRLI today. Previous Post: « Can Shampoo Cause or Contribute to Hair Loss?